Omnia offers a complete line of drapes, which are ideal for a wide range of applications and procedures for both covering operatory surfaces and for draping and protecting the patient. Drapes for surface covering are made of two layers of non-woven fabric: the absorbent layer quickly absorbs any biological and cooling liquid, while the waterproof layer has a 100% waterproof structure ensuring a complete barrier to fluids and microorganisms. 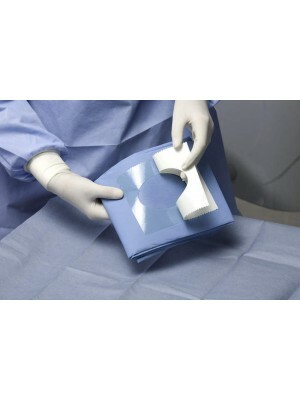 Drapes for use on the patient are made of either absorbent/waterproof non-woven fabric or Softesse®, a fluid-repellent, drapeable and highly breathable material. The entire surface of all patient drapes is waterproof and they all have fluid control systems and self-adhesive areas (self-adhesive U-shaped, hole or side) to allow a safe and accurate adhesion while enhancing the range of sterile fields. All drapes are equipped with labels containing instructions on how to properly unfold. 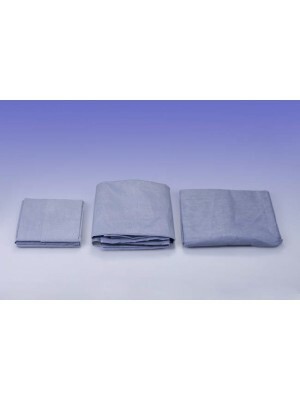 Fluid-repellent drape with self-adhesive side 26.4"x29.55"
Fluid-repellent fenestrated (hole 2.36"x3.55") drape 26.4"x29.55"
Measures: Remove This Item 26.4"x29.55"